In addition to modifying and scratch building doors for these cars, I tried to model the hand brakes for which no commercial detail parts are made as far as I know. The box and handle are shaped from styrene. The handle has a short piece of 0.008” diameter phosphor bronze wire at the end to serve as a grip. A short piece of wire insulation was ACC’ed to the bottom of the box and another piece of small diameter wire was formed into a “U” shape to attach the chain to the insulation and ACC’ed in place. Likewise a small piece of wire insulation was attached to the bottom of the carbody in the corner made by the door frame and another small “U”-shaped piece of wire was used to attach the chain to this point. I also modified the Bethlehem Car Works Symington Gould High Speed trucks by filing the upper corners of the sideframes to a shape more closely resembling the Symington Gould XL type truck. As mentioned on the Head End Equipment page in the car description, construction of the Red Ball kit ground to a halt when I began to assemble the underbody to the car body. As shown in this photo, there is an interior piece installed at both ends of the car body with a hole that’s supposed to align with the underbody bolster hole for mounting the trucks. On my kit, when I tried to mate the underbody to the car body, the holes were close to ¼ “ out of alignment. The instructions mention nothing about test fitting the parts, or checking the dimensions. Trying to force the parts to mate correctly almost pulled one end off the model, so I set this project aside for awhile until I felt up to the challenge. I had used ACC to install the parts in the car ends so this bond broke with only a little effort. After that, I carefully test-fit the pieces and measured the distance from the car end to the hole, keeping in mind that I had about ¼ “ to play with. I went through the process of cutting, filing and test-fitting about three times before I was satisfied with the fit. This was definitely the worst part of assembly, but having survived it one time is enough to prepare one for building additional cars. Car 5507 was included in the group of steel baggage cars converted for messenger service and was produced by Athearn (kit 2506) several years ago in the McGinnis New Image scheme. Many modelers are satisfied with the car as produced by Athearn, and by simply replacing the 6-wheel trucks on the model with 4-wheel trucks, the car makes a reasonable stand-in model. At 72’ overall length the model is close to the prototype which was 73’ 3⅝” over the end sills. The Athearn car can be made to more closely resemble the New Haven messenger service car with a little surgery on the sides to correct the door arrangement and location. Done carefully, this can save the Athearn lettering on the car if that’s desired. Door Arrangement: The Athearn model comes with an 8’ door and a 5’6” door on each side of the car. While the door widths are very close to correct, the two wide doors are located directly across from each other towards one end of the car and the narrower doors located across from each other towards the other end of the car. On the New Haven 5500-series cars, one wide door was across from a narrow door at each end of the car. This means that on one side of the Athearn car the doors are in the correct arrangement but on the opposite side the doors must be “flipped” end for end. With the model lying flat on one side, if the end of the car with the hand brake wheel is positioned to the left, the side being viewed is the side requiring the doors to be flipped. If the hand brake wheel is on the end of the car to the right, the side being viewed has the two doors in the correct arrangement. Door Location: Now, if the door arrangement is being corrected, it’s not much more work at all to correct the door location on the sides. The Athearn model has about 24’ from inside door frame to inside door frame spacing while the prototype is 17’7”. If a 3’3” wide section of wall adjacent to the inside of each door is moved to the outside of that door frame, the length of the car side between the doors is reduced to 17’6”, which is very close to matching the prototype. The photo shows the side of the car with the hand brake wheel on the car end to the left in the photo. The doors on this side must be “flipped” so the narrow door moves from the left to the right while the wider door moves to the left. Because of this shift the 3’3” section of wall is cut with each door towards the inside of the door frame and after the door and wall sections are removed, the remaining wall section has to be cut below the horizontal rivet strip along the roofline and shifted a little to the right from its original location. Because the doors are in the correct arrangement on the opposite side of the car (hand brake wheel end of car to the right), the 3’3” section of wall adjacent to the inside of each door is cut and moved to the opposite (outside, towards the car ends) side of the door. The shortened section of wall on this side of the car does not require cutting and relocation. Once the doors are relocated, all that remains is to install Ward type ventilators along the clerestory using a photo as a reference guide. I used some old Eastern Car Works vents, but Bethlehem Car Works makes these as well as a suitable Standard Motor Co, 4-wheel truck. After the surgery is complete it's time to install correct 4-wheel trucks that are available from either Bethlehem Car Works or Custom Finishing. The last steps to complete the conversion are to remove the “NEW HAVEN” from the letter boards after which the red-orange will be repainted before re-lettering and to fabricate new doors from sheet styrene. I chose to keep the lettering on the black painted areas since it is reasonably accurate and was not damaged during the modifications. This photo shows the car with repainted letterboard and new doors fabricated from 0.005" sheet styrene. I used clear sheet styrene for the small window panes in the doors. To avoid fogging or smearing glue on the clear "glass", I used Testors Canopy Adhesive that's made for plastic aircraft models. When I test fitted the doors I saw I had to remove a little of the top of the old baggage door windows because the new, smaller windows are slightly higher in location and I wanted to prevent seeing the old door through the new window. The completed car is pictured on the "Head End and Other Cars page. Always begin by procuring appropriate drawings and photos of any car you are going to model. I based this project on photos of three cars in Sweetland and Horsley’s "NH Color Guide to Freight and Passenger Equipment". The windows are part of the roof which is held to the carbody by a total of six tabs (three per side) that extend from the bottom of the clear plastic “glass” through the underbody. Holding the carbody firmly on the sides, apply pressure (gently at first) to one of the tab bottoms protruding through the carbody slot. I used one side of a pair of miniature flat-nose pliers but a small flat screwdriver blade could also be used. Once the roof is slightly lifted above the top of the carbody a thin flat object such as the edge of a scale rule can be slipped into the shallow space between the top of the carbody and the edge of the roof so the roof can gently be pried up from the carbody; first on one side, then the other. Once the roof is free the row of vents down the center of the clerestory can be removed by slowly, gently and carefully pushing the tip of a chisel blade along the surface of the roof under the vents, one at a time. Be careful to avoid damaging the small electrical contacts and springs located at the bottom center of the window “glass” on each side. If the part is handled carefully the springs should slip back onto the contact posts on the edge of the car floor during re-assembly. Study the sides of the clerestory to see the small vertical ribs. You may have to remove one or more on each side later when you are adding the Safety vents in order to insure a snug fit of the vent to the clerestory. Turning back to the carbody it’s time to remove the lettering. I had very good luck applying Microscale Micro Set (blue bottle) and using an eraser to remove the letterboard lettering. I also had luck using this method to remove the car number, but it is well nestled in the overly heavy rivet detail so takes some perseverance to remove. Finish by removing the 6-wheel trucks. This is accomplished by removing the screw located inside the car in the center above the truck bolster. The truck will drop down and will still be attached to the car by a soldered wire for lighting. I was not sure the car lighting would work upon re-assembly or if I would be satisfied with the operation of the car lighting if it did work, so using a single-edge razor blade, I carefully separated most of the wire below the solder joint. There is enough wire that a new end can be stripped for connection to the new truck. You can pull out your soldering iron to heat the solder and remove the entire wire if you prefer. The last part to remove is the post from the center of the 6-wheel truck. Studying the truck shows the post becomes a round pedestal at the base where it is joined to the flat center part of the truck span plate. Slowly and gently, slip a chisel blade under the round pedestal and separate this part of the post from the flat span plate below. Once done, either scrap the trucks and wheels or consign them to the spare parts box as you prefer. Start with the truck post pedestal that was just removed. I used 0.040” sheet styrene and glues a piece below the pedestal so I could trim the edges to the round shape. When the cement was dry I added a second piece below the first so that I added about 0.080” thickness to the round pedestal base. This is needed so the Walthers truck will set at the correct height. Once you have shimmed the post you may want to dry assemble the truck and post through the bolster and carbody to check the coupler height and adjust by adding more shim or sand away excess. Make sure you know the top of the post orientation before proceeding with the next steps. The top of the post is square and should be oriented so it appears like a “diamond” instead of a “square” when the bottom is glued to the new truck. This is to be sure the top of the post will fit correctly into the hole on the bell-crank assembly that connects the coupler pocket to the center of the truck. Once certain the coupler height will be correct, cement the shimmed post to the center of the Walters truck span so the top section appears to be a “diamond” shape looking along the truck axis from end to end. Set aside to dry. Move on to the roof and make sure you have filled and sanded any scratches, scrapes or gouges remaining from removal of the old vents. Add the Safety Vents to each side of the clerestory using photos as a guide for positioning. When complete, paint the roof with new vents flat black and allow to dry. I painted and numbered these cars based on the photo references noted above. Two coaches are green and one is in the Black Knight scheme. At this point I simply re-lettered the sides of the two green cars and painted the third in the Black Knight scheme before re-lettering. 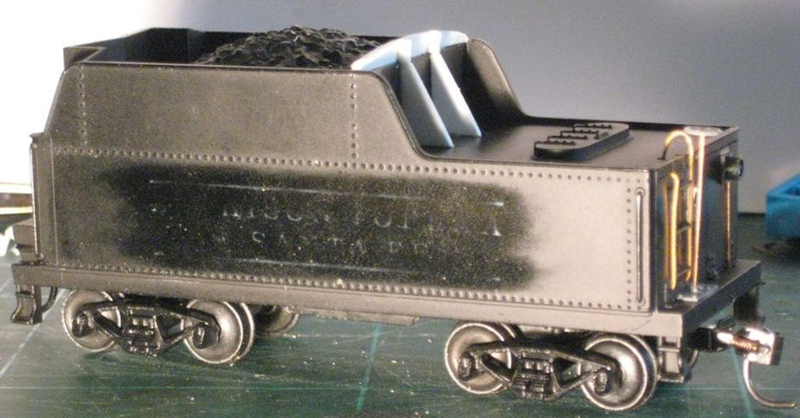 Unlike my freight equipment I spray my passenger equipment with a semi-gloss clear coat rather than a flat coat. Whether the passenger cars are green, black or stainless steel, I think the semi-gloss finish represents that passenger car exteriors were cleaned more often than freight cars. Before re-installing the roof I used Testors Clear Parts Cement to attach small bits of tissue inside the saloon window area. While this is drying, re-install the trucks. I connected the lighting wire to one screw on the Walthers truck assembly. Attach to opposite sides of the truck on opposite ends of the car. At this time I have no idea if the Walthers trucks are insulated or if this will work or not, but I will probably re-light my entire passenger car fleet at some point in the future. You may want to test the circuit at this point if you want the lighting to work immediately and will be satisfied with the lighting performance. If the trucks are non-conductive, a simple and effective wheel wiper can be made using the phosphor-bronze insert that comes with every package of Kadee #5 couplers. The part will have to be bent to work properly, and it may need to be cut as well. Use the hole on this part to secure it under one of the Walthers truck screws. The lighting wire will be soldered to the flat area of the part, and the two thin “spring” sections are bent to contact both wheels on one side of the truck and act as wipers for electrical contact. Once the trucks are re-assembled with the bell crack inside the car, install the roof and firmly press it down to engage the tabs through the carbody to the underframe. See? Only two simple steps! 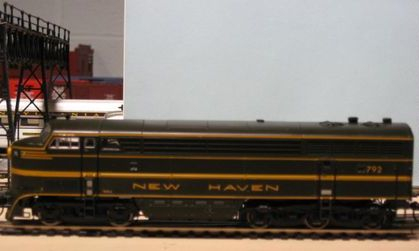 As reviewed on this site previously, back in Fall 2007 True Line Trains produced HO scale New Haven CPA24-5’s in both delivery and McGinnis paint schemes. While the models are a welcome addition to the locomotive roster of those modeling after 1951, they do have their problems as delivered from the manufacturer. I’ve completed the modifications to my two units to “New Havenize” them. I consider the changes I’ve made to be somewhere the “bare necessities” and “contest quality”. You may want to do more or less as suits your modeling goals and skill levels. For my green and gold unit I began by removing the unnecessary sunshades and grab irons; the two long horizontal grabs on the side of the nose, the two short horizontal grabs that cross the short vertical grabs located along the rear sides of the unit and the two vertical nose grabs. It’s best to consult photos of the unit you are modeling as some units were equipped with grab irons at some point in their career, particularly if they were modified with MU connections. I also removed the horizontal grabs located on the side of the pilot. I drilled new holes for these grabs and installed them on the top surface of the side of the pilot. The exhaust stacks located about 2/3 towards the rear of the roof are also too tall for the New Haven units. I applied tape around and between the stacks to prevent marring the roof surface and with a 0.040” thick ½” wide strip of sheet styrene as a guide I shortened the stacks. The styrene is laid on its side so the ½” width provides a spacious flat area to rest the blade of the razor saw horizontally across the roof for and even cut. The next step was to remove all the lettering and numbers from the unit so that only the striping remained. So far the process that has worked for me on models from a variety of manufacturers is to apply a small coat of Microscale decal setting solution with a brush and then use an eraser to remove the lettering or roadnumbers. I’m currently using a Faber Castell eraser that is sold in pencil form so it can be sharpened in a standard pencil sharpener to produce a fresh surface. I’ve also used a “Magic White” eraser, and other modelers I know have success using a plain pencil-tip eraser. If you have your own preferred technique I recommend testing it on the numbers on the rear of the unit just to be safe. The same advice applies if you’re trying a decal setting solution other than Microscale. With the lettering, herald and roadnumbers removed (except from the numberboards on the nose) you can begin to apply correct lettering. I used lettering from two different Accu-cal New Haven Green & Gold Cab Unit sets I had on hand, but you should be able to get by with Microscale sets 87-1060 (lettering and numbers) and 87-1061 (stripes) if you don’t have anything on hand. Replace the script herald and road number on the nose, the roadnumber on the sides and rear of the unit and the “NEW HAVEN” lettering along the sides. Consult the supplied lettering diagrams and photos for correct locations, and don’t forget the “F” and “DER-4” lettering to designate the front and locomotive class of the unit. In addition to the lettering, apply short lengths of striping of the correct width to extend the stripes that end on the side of the model to reach the end of the model, matching prototype photos. With the lettering changed, the model is much better looking and there are only a few more items to attend to. All the grabirons and handrails should be black. These parts are made of a slippery engineering plastic on the model, so I used Testors “RC” paint sold under the Pactra label. The lacquer versions of these paints are specially formulated for good adhesion to slippery engineering plastics and remain somewhat flexible when dry to prevent chipping. I used Pactra RC “Outlaw Black” on the handrails and grabirons on my model. I also modified the horn area on my model to more closely resemble the prototype. While the model is made with a raised lip at the front of the horn area on the roof with two small slots in the front, the prototype had a visibly lowered roofline at the front where the horns were located. After removing the horn carefully tape the surrounding area to avoid damaging other details. Use a razor saw to cut vertically down through the “outside” of the left- and right-hand edges of the slots. Just as carefully, I make a horizontal cut across the center of the roof above the windshield and in line with the bottom edge of the two slots. Be careful, this cut cannot be made all the way through the raised lip to the depressed area behind the lip without making cut marks beyond the horn area, so only cut as deep as possible while not damaging the surface of the model. The area is cleaned out using a #17 chisel blade in my X-acto knife. Use small files to clean up the area where the lip has been removed so that the bottom and edges match up closely with these features molded into the roof of the model. Final dressing of the cut-out area is completed with progressively finer sanding and polishing sticks. Once the area is cleaned up drill two #61 holes for installing a pair of Details West #174 WABCO Type E Single Chime air horns painted black, and the unit is complete. I have not plugged the holes for the horizontal grabs removed from the rear sides, the holes on the side of the pilot left from relocation of those grabs to the top of the pilot, or the vertical nose grabs. I did use styrene rod to fill the holes left from removal of the long horizontal grab on the side of the nose. I then used bits of decal stripe to cover the filled holes. If I get around to filling the remaining holes, the styrene rod will be painted…hopefully some shade of green that’s close to the body color. The prototype was repainted from the green and gold delivery scheme to the ‘New Image’ scheme in early 1957. Between 1955 and 1959, several DER-4’s, including 798 were fitted with MU equipment. Photographic evidence suggests than MU-equipped units also featured the long vertical nose grabs and a nose-mounted pilot light. 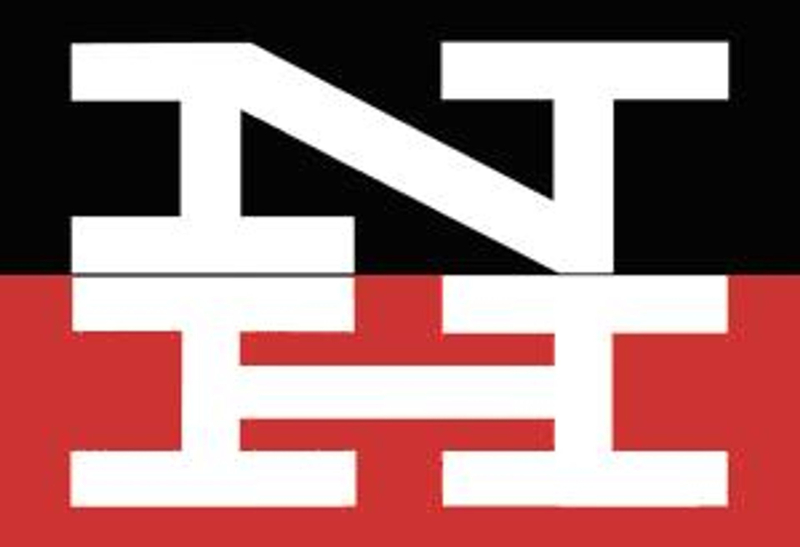 My reference photographs show that when repainted, 798 did not get a roadnumber on the nose below the block ‘NH’ logo. Similar to the delivery scheme unit, begin by removing the sunshades and grabs as described above. I also removed and set aside for reinstallation the vertical nose grabs at this time to facilitate removing the manufacturer-applied nose herald and for repainting. The short grabs were also relocated from the side to the top of the pilot, and the exhaust stacks were shortened as described for unit 792. 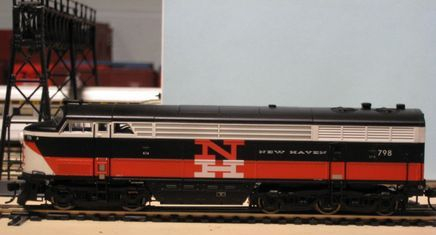 My opinion was the ‘New Image’ ‘NH’ on the sides along with the serif “NEW HAVEN” was close enough in appearance and size to retain, so in addition to the nose herald and roadnumber, I removed the roadnumbers on the sides and rear of the unit using the technique described above. For this unit I used the CPA24-5 nose herald and roadnumbers from Microscale set 87-937, “NH Cab Diesels 1954-1968”. I extended the white and red-orange color bands to the ends of the sides of the body using pieces of white and red-orange decal cut from “N”’s and “H”’s from a very old Microscale set (no longer cataloged – “RH68” which included decals for both green & gold and ‘New Image’ cab units and electrics – quite a set!). The color match is quite good. The red-orange is opaque enough to cover in one layer, but the white decal over the black car side required two layers for good coverage. Above, the "Before" and "After" shots. I used the blue background to make viewing the shortened exhaust stacks less difficult. After applying the nose herald I painted the vertical nose grabs with the Testors (Pactra) “Outlaw Black” and reinstalled these parts and the grabs on top of the pilot, then modified the horn area as already described before installing the WABCO Type E horns. As before, I have not filled the holes left on the sides of the pilot after relocating the grabs nor have I filled the holes from removal of the short horizontal grab at the rear sides of the model. I did fill the holes from removal of the long horizontal grabs along the sides of the nose and cover these with bits of red-orange and white decal. As of this update, the unit is complete with the exception of the Details West #172 Step Light which will be installed on the nose and painted black shortly after delivery to my local hobby shop! South Boston Freight Terminal Continues to develop and although it is not detailed at all, it is finally far enough along for me to present an visual idea of where my modeling is taking me. Although I will not model every location on my layout as faithful to the prototype as possible in all cases, this is an example of how I will proceed with modeling certain sections of the New Haven. The above copy of a Fairchild Aerial survey was graciously provided to me by Paul Beattie. For those note familiar with the area, I've labeled the key design elements I have tried to incorporate into my layout design for this section of my layout. For orientation, we are looking North at the top of the photo. Fort Point Channel is situated to the West (left) of this survey area. Summer Street, which passes by South Station, crosses Fort Point Channel, and over South Boston Freight Terminal on a series of steel truss bridges in the lower left of this photo. Just above the Summer Street overpass and passing between the freight houses numbered 8 and 7, and 10 and 9, is Congress Street, which crosses South Boston Freight Terminal at grade. Congress Street appears washed out in the photo, but the Yard 5 tracks can be seen just North of Congress Street, indicating the crossing. Above where I have labeled Yard 5, trailers are visible on the concrete apron between pairs of tracks. This was the TOFC (Trailer On Flat Car) transfer area in Boston. Yard 5 extended North to Northern Avenue which can be seen running from West to East in the photo separating the yard tracks from the piers along the waterfront. Midway along the right-hand (East) edge of the photo the A&P Fish and Produce warehouse. A&P is the old Atlantic and Pacific Tea Company supermarket chain. 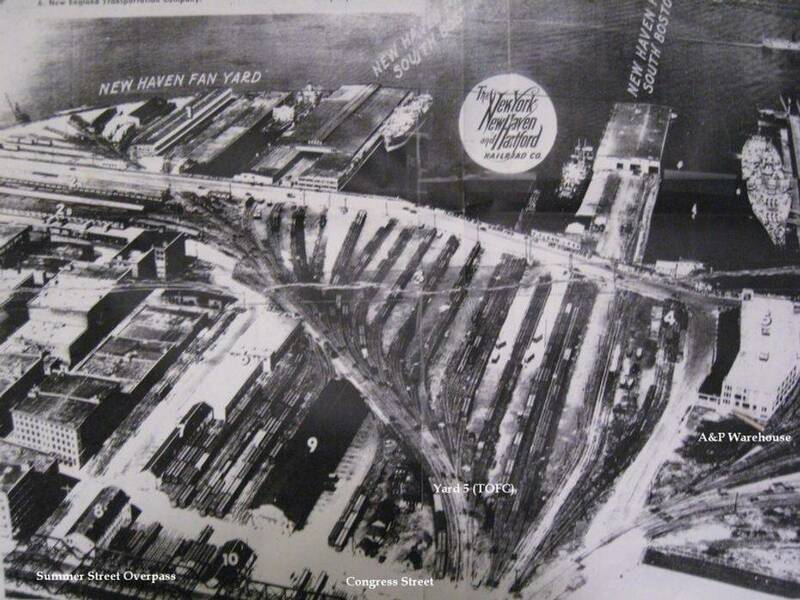 A strategic benefit for the New Haven was the location of this yard at the major nexus for the seafood industry in New England. The pier to the right of the New Haven script herald is Pier 4, which later became home to the landmark restaurant, Anthony's Pier 4. 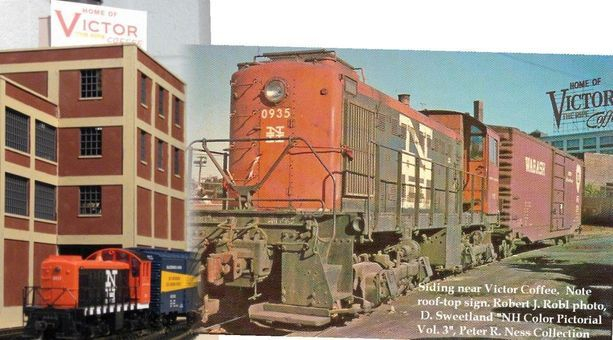 South Boston Freight Terminal was the principal destination in Southern New England for scores of refrigerator cars laden with produce from across the country to serve a hungry New England market. From the above area and researching published photos, I've identified what to me are some key design elements that I had to include on my layout. Pictured below are my beginning steps in this process. In trying to depict what I'm striving for I'm trying a technique that's new to me..."stitching" images together. Of course, I'm not applying the technique how it's meant to be done, but I think the result shows where I want my efforts to take me. Here's an overview of the area around Congress Street, South of the view in the aerial photo. In the prototype image I've labeled the key structures I'm including on my layout. In the extreme left-rear is the Brown-Wales Steel Company. On my layout, I'm using an old Magnuson Models "Brach's Candy" resin building kit to represent this business. Because I do not need a detailed rear wall on this building, I cut and spliced the front and rear walls together to yield a longer structure. Currently, Walthers produces a plastic building kit called "American Hardware" that is similar. Eventually I will fabricate a roof-top sign to replace my paper version. The next structure located in the middle of the prototype photo is New Haven Freight House No. 10. To the left in the photo, two similar brick buildings (from right to left) are Freight Houses 11 and 12. Yard 4 trackage ended in proximity to these freight houses, but on my layout the trackage for Yard 4 continues past all the structures and ends just before the Summer Street overpass, which is about where the prototype photo was taken. To the right-rear of the photo, the tallest building in the distance, is the Victor Coffee Company. While the building style is similar (concrete and brick), I've used a Walthers "George Roberts Printing Company" kit to represent this building. Because of it's location against the wall on my layout, I was able to kitbash this structure to make better use of the walls that would have been against the rear edge of the layout. 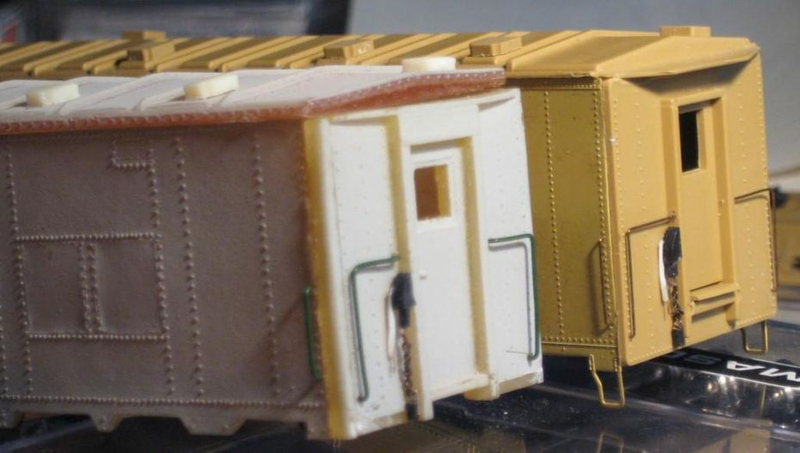 Here's a close-up of my Freight House No.10 compared to a detail from the prototype photo. To build this structure, I used the leftover pieces of wall from two Walthers "REA Building" kits. The first- and third-stories from the two kits were used to build the REA house at South Station which left me a total of four second stories and two ends. I assembled these, used some Plastruct brick sheet material and .040" sheet styrene to fill some gaps on the lower floor and replaced some windows with leftover loading doors from the Walthers "Prairie Star Mill", which became my Domino Sugar building...confused yet? This signage on the end of my model was made with computer software. I positioned the text on a "brick" pattern background to blend it in to the building a little bit. It's not permanently affixed since I want to fiddle adjusting the color more. Ultimately, weathering will blend it into the structure. The roof-top sign was also made using computer software, printed on white paper which was then fixed to sheet styrene and then cut to create the separate sign boards and support frame. To the left is a comparison of rail service near the Victor Coffee Company. It was interesting to me that in the older photo above, there is a sign on the side of the building, but the roof-top sign is not visible as here. I decided to include both types of signage on my model. Again, the sign is not permanently attached to the model. I've tried a couple of different fonts for the word "Victor" on this sign, and I think my final version will revert to an earlier font type than shown here as it more accurately reflects what is shown in the photo. Here we are at Congress Street crossing. In the earlier photo Congress Street is cobblestone. In the background the Summer Street overpass is visible, demonstrating the close proximity of these key elements. Unfortunately, my layout is 14" in width at this point, so some severe 'selective compression' was employed to deisgn this section. The large "hunk" of bridge support butting the rear wall of the layout is scratchbuilt from sheet styrene and the concrete bridge piers are Crow River castings. The NETCo tractor-trailer is entering Congress Street from an arch in the Summer Street overpass. The arch leads to the loading docks at Brown-Wales, located adjacent to the far side of the overpass. Because this area is a view block for rounding the corner of the benchwork for South Boston Freight Terminal, I used three of the Crow River Bridge piers for the section of the Summer Street overpass that spans five tracks. This is a bit of non-prototypical overkill, but it's effective as a scenic divider, and I like the look of the freight cars passing oh-so-close to the concrete piers without knocking into them...that whole tight clearance thing. Here's the other (North) side of the Summer Street overpass. In the prototype photo, the HH600 is heading South approaching the Congress Street grade crossing with Yard 5 in the background. The shadow of the bridgework is clearly visible in the photo. While I will have HH660's working South Boston Freight Terminal, I haven't built mine yet, so an Alco S-1 is standing in for now. You can barely see the result of my feeble attempt to create a bridgework shadow in my photo...hey, I'll learn! Congress Street is constructed from Plastruct brick pattern sheet styrene. I learned that I am not crazy about making grade crossings if there is more than one track involved and also that I am not crazy about grade crossings on curves even if there is only one track!!! Also because of selective compression, my A&P Fish and Produce Warehouse is postioned immediately North of the Congress Street crossing, unlike the prototype. The A&P Warehouse is kitbashed from a Walthers "Hardwood Furniture" kit. To make efficient use of the walls and add interest, the kitbash included relocating the main entrance to the side of the building and the loading docks were moved to where the "front" would have been. Basically, the walls were rearranged so the through-building track ended up located on the rear wall. On my layout, the two tracks to the extreme right represent State and Government Yards. Although pretty small, the total capacity of both tracks is about 7-8 cars (depending on car length) which at leasts allows me to send some cars to those tracks. Not visible in any photos I have of South Boston Freight Terminal, Domino Sugar was located on the same side of Fort Point Channel and very visible from the South Station side of Fort Point Channel as shown in the prototype photo. The very large roof-top sign was present for decades. For purposes of this update I postioned the Domino Sugar Building a bit North of it's final location on my layout. As positioned here, Domino Sugar is viewed from between Signal Bridges 7 and 8 at South Station. Beyond Signal Bridge 8 will be the beginning of my Lift Bridges crossing Fort Point Channel. The prototype photo is taken on the girder spans just South of the Lift Bridges as a point of reference. As stated earlier, I used a Walthers "Prairie Star Mill" as the basis for my Domino Sugar. Since this building is against the rear of the layout, I kitbashed all the walls for the sides and front to make a longer, taller structure. The modular wall design of this kit is very flexible, and it's easy to piece togther this building, which looks very different from the kit design and really dominates the view on this section of layout, as it should. Sitting atop the roof of the Domino Sugar Building is a rooftop sign kit that was custom-made to my design by Model Tech Studios. As seen in the prototype photo, this sign is huge, and although Bar Mills did produce a Domino Sugar sign, it would be overpowered by this building because of its smaller size...and it's out of production with Bar Mills no longer producing such signs.